The capital of the Chazars in the tenth century; situated about eight English miles from Astrakhan. Together with the city of Balanjara, which was equally renowned in ancient times, it is now buried under the highest of the numerous mounds covering the right bank of the Volga, called also Atel ( , "Sefer ha-Ḳabbalah," in "Med. Jew. Chron." i. 78, 190). According to the Arabic writers, Ibn Fuḍlan, Ibn Ḥaukal, Ibn Kaldun, Mas'udi, and others, Atel was situated about sixty miles from the mouth of the Volga. The western part of the city was surrounded by a wall with four gates, one of which led to the river, and the others to the steppes. Here lived the ḥakam of the Chazars, whose palace was the only building of brick in the city. The rest of the inhabitants dwelt in huts, or in tents of felt. Mas'udi, however, states that the palace of the ḥakams was situated not in the western part of the city, but on an island, and the city consisted of three parts. The eastern part, called Khazaran, was inhabited by merchants of various nationalities. Atel had a large population of Mohammedans, Christians, Jews, etc. The Turkish and Chazar languages predominated. Some of the inhabitants were called "blacks," and the others "whites," according to their complexions. 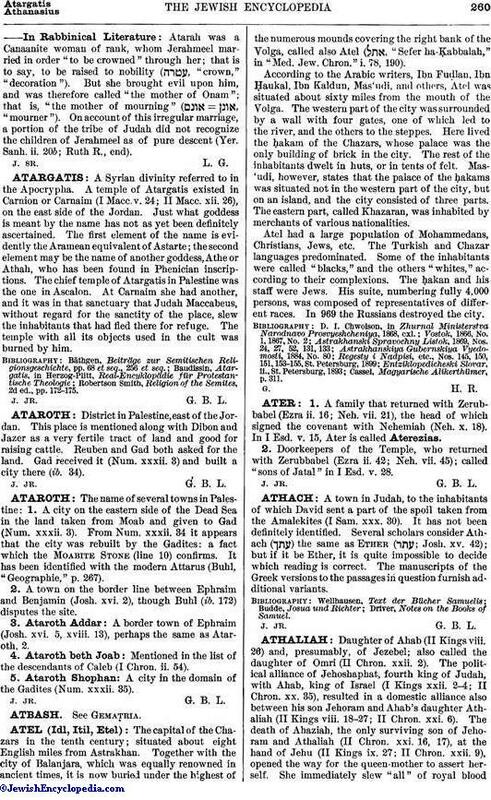 The ḥakan and his staff were Jews. His suite, numbering fully 4,000 persons, was composed of representatives of different races. In 969 the Russians destroyed the city. Cassel, Magyarische Alikerthümer, p. 311.